At the Ayurvedic Wellness Centre, we are lucky to have a fully qualified doctor and a number of highly trained Ayurvedic therapists on our staff who are experts in traditional Indian Ayurvedic Medicine. This qualified and experienced team are able to assess, diagnose and recommend the correct treatment path for a wide range of different ailments. To find out more about the different ailments Ayurveda treats, please click here. If you choose to consult with one of our doctors, you will experience a thorough consultation that examines the health of your entire body and mind. 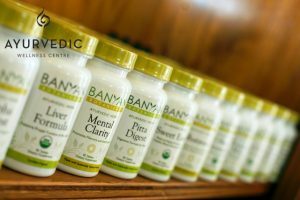 Ayurvedic medicine seeks the root cause of the problem and corrects any imbalances that may be occurring to return balance and wellness to your body. Ayurveda treats every individual as completely unique and thus your treatment plan will be exclusively tailored to your specific needs. It’s important to note that you don’t need to be ill for a consultation. If you are seeking a better pathway to a balanced body and mind it can be just as beneficial. You also do not require a consultation to experience any of our spa or massage/body treatments.